Having these beautiful fresh damsons to pick for free from my parents’ garden inspired Mr Portions and I to use them for something a little more exciting than jam. Damsons are an often overlooked member of the plum family because people always think of the tiny tart variety that will burn through your teeth at twenty paces. These are more like eating plums and very fruity and sweet. This is a rich, fruity liqueur – perfect for quaffing during the mists and mellow fruitfulness of autumn. It is syrupy and tastes like alcoholic prune juice; it’s deceptive because the booze isn’t immediately obvious but really packs a punch! NB. If you don’t wish to use Polish pure spirit, simply replace it with extra vodka. Wash the damsons and pat them dry with a paper towel. Cut them in half and remove the stones – this is pretty easy as the damsons will be soft. Place the prepared damsons in a kilner jar. Add the sugar and close the lid. Shake. Add the vodka and Polish pure spirit and close the lid. Shake. Leave in a quiet spot, at room temperature for 4 weeks and shake occasionally to ensure the sugar mixes in with the damsons and vodka. When the month is up strain the mixture using a fine sieve or straining bag. Then move on to a more refined filter either lining a sieve with a butter muslin or a coffee filter (but this can get clogged requiring frequent changing of the paper). Bottle your liqueur and age for a further month. Ginger, honey and single malt whisky – for many this would just about be heaven! Mr Portions is a fan of whisky liqueur and viewed this as the ultimate honey-lemon cold remedy...in fact, since we made this it’s amazing how many “colds” Mr P has had! Add the chopped ginger and lemon zest and boil for a further 5 minutes. Remove from the heat and leave to cool until the mixture is warm but not hot. Pour into a kilner jar along with the whisky and swirl around. Store in a cool, dark place for 4 weeks. Age 2 more weeks, then your liqueur is potable. Mr Portions and I are determined to become more skilled in the art of foraging. It’s amazing how many fruits and berries around you in everyday life are edible. There may be no such thing as a free lunch but there are definitely free crab apples – easily identifiable as they are tiny apples. In the name of research we each took a bite. I gagged more than Mr Portions as they are sour and I have a sweet tooth. The liqueur would definitely need sugar! We picked the crab apples before they got a red blush from the sun – we were looking to make a tart liqueur. Wash, chop and core the crab apples. This is a bit of a faff as they are small and hard but it’s worth it so share the task and make witty conversation to pass the time. Place the prepared crab apples in a kilner jar. Leave in a quiet spot, at room temperature for 4 weeks and shake occasionally to ensure the sugar mixes in with the crab apples and vodka. Bottle your liqueur and age for a further month. It was a touch “punchy” after a month but some people liked that – if you don’t, leave if another couple of weeks and try again...it will mellow over time! ...or “Purple Gold” as I think it should be called. This one is a stunner – of all the liqueurs we’ve made so far this is the most luscious, the smoothest, the most quaffable. Can you tell how much I love it? The only thing I’ve ever had that I can compare it to was a 40 year old exquisite port. Yes...it’s THAT good! Conventional wisdom says that blackberries come into season at the end of August. 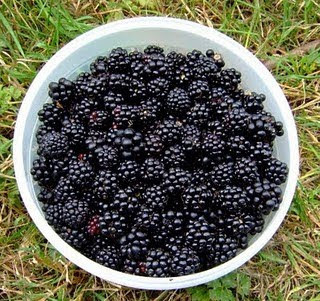 I commute to work by train and could see lots of ripe blackberries at the end of July. It must be down to the hot summer we had. Sadly, the train driver wouldn’t stop the train and let me get off to pick them, so Mr Portions and I went to our nearest country park and got foraging! The blackberries available were big, dark, juicy and soft. Wild fruit is always so much softer than commercial fruit. We picked lots more than we needed for this liqueur and feasted on blackberries until our fingers were purple. Wash the blackberries and place in a kilner jar. Mash them so they start to release some juice and flavour. Add the vodka and Polish pure spirit. Seal the jar and swirl the ingredients round. Store in a cool, dark place for 2 weeks. Add the sugar syrup and reseal the jar. Swirl around to ensure contents mix. Store in a cool, dark place for a further 2 weeks. The liqueur wasn’t full and fruity in flavour after filtering so we aged for a further 2 weeks. After waiting the extra 2 weeks re-filter and bottle your now-potable liqueur! ...to our little site showing you how to make delightful potables in your own home. What is a potable, I hear you ask? It's something that you can drink. Over the weeks, months and years to come I, along with my beloved Mr Portions, will share with you our favourite recipes for home made liqueurs and other potables. You'll be amazed at what you can achieve with fruit, vodka and some kilner jars!